﻿ HuntingNut » Forums » Firearms, Shooting & Reloading » Reloading Ammunition » W.T.F. Posted: Mon Jan 26, 2015 8:56 pm Post subject: Re: W.T.F. Posted: Mon Jan 26, 2015 9:38 pm Post subject: Re: W.T.F. Posted: Mon Jan 26, 2015 9:52 pm Post subject: Re: W.T.F. 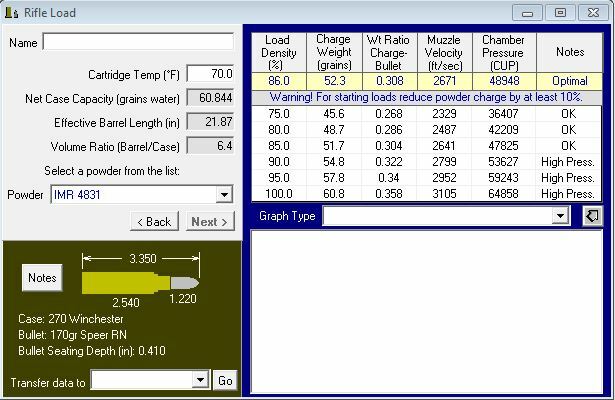 Which specific 170 grain projectile and what OAL are you using? Posted: Mon Jan 26, 2015 9:53 pm Post subject: Re: W.T.F. yes it is .270 calibre they very old projectiles. Posted: Mon Jan 26, 2015 9:59 pm Post subject: Re: W.T.F. when seating projectiles I cant have die set as normal I have to back it out of press as cant unscrew top enough to get projectile started. Posted: Mon Jan 26, 2015 10:21 pm Post subject: Re: W.T.F. LOL, that does it.. I have no data at all for Speer 0.277 at 170 grains ..
Elvis could you measure the projectile length for me? Posted: Mon Jan 26, 2015 10:58 pm Post subject: Re: W.T.F. Posted: Tue Jan 27, 2015 1:08 am Post subject: Re: W.T.F. Posted: Tue Jan 27, 2015 4:36 pm Post subject: Re: W.T.F. I just checked Speer's website and they no longer list a 170gr. bullet. That may be the reason the powder companies stopped providing load data for it. My 48th edition of Lymans also does not list 170gr. bullet for the .270. Posted: Tue Jan 27, 2015 4:39 pm Post subject: Re: W.T.F. I just ran some data thru LFAD and it came up with this for the speer 170gr round-nose bullet using IMR 4831. Posted: Tue Jan 27, 2015 11:06 pm Post subject: Re: W.T.F. thanks guys that has me sorted now. Posted: Sun Feb 01, 2015 6:13 am Post subject: Re: W.T.F. I think your still confused........ 170gr bullets belong in 30cals !!! Posted: Sun Feb 01, 2015 2:31 pm Post subject: Re: W.T.F. :wtf: I think your still confused........ 170gr bullets belong in 30cals !!! Posted: Mon Feb 02, 2015 2:58 am Post subject: Re: W.T.F.